The one calendar that man has no control over is the one that governs gardening. 201 days in the growing season. that there will be little time to grow cold crop in this region as we will surely have a very short spring. Community Garden Members: Please remember that your bed must be cleared, turned and planted by June 15, 2018. We are looking for volunteers to help maintain the "Teaching Garden". We also need Volunteers to help during Outdoor Classroom Activities. nature is forever changing the drama." 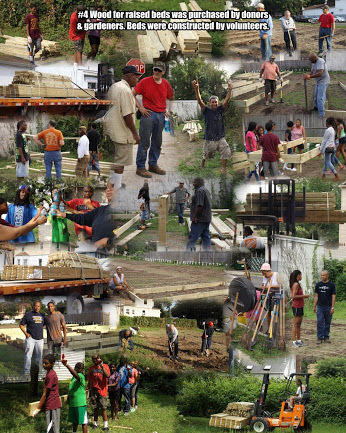 The Louie Bacoat Historic Community Garden has been in existence longer than anyone alive can remember. According to "the Old Timers", including Mr. Bacoat's own family, 206 Lafayette Place in Englewood has always been a garden. According to the 1942 "Old Man's draft registration records, Louie Bacoat was already in Englewood, New Jersey. According to his family, he was a farmer in his native Darlington, South Carolina and was already continuing to farm in Englewood, NJ. Mr. Norman Gainey joined Mr. George Owens and his brother Kenny in the garden in the early 1970s. Mr. Owens and his brother ceased to farm the land in 2012. 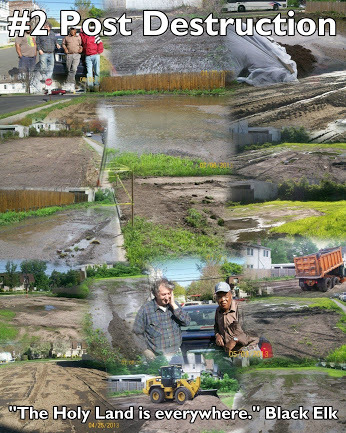 The land lay fallow in 2013, because of the damage done by the bulldozer and subsequent flooding. The Garden could not be planted in 2013. The County and the Bergen County Parks Department answered our pleas for help in 2014. They brought in heavy farm machinery that tills deeply. 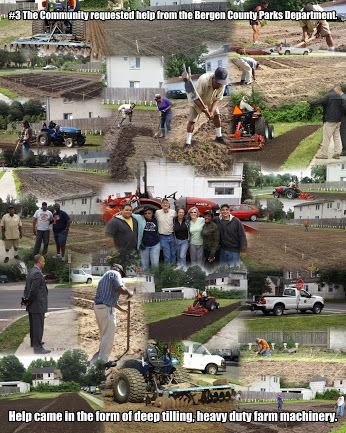 They donated 3 tandem truckloads of topsoil and shared the services of some of the County Park's employees. These men were invaluable in the restoration and transformation of the Garden into what it is today. 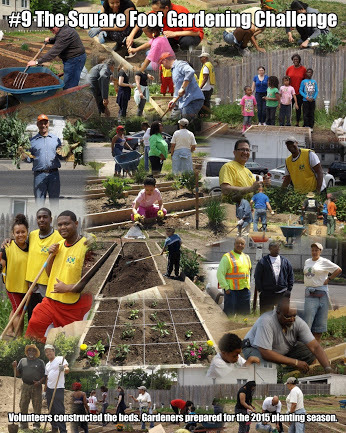 In 2014, Mr. Gainey helped us transform the traditional row garden into a Community Raised Bed garden before moving his family back to his native South Carolina. He helped us all embrace the concepts of water conservation with his signs that demanded we not water his beans. His ideas paid off when his beans were ready to harvest in 35 days without faucet water. We decided to name the garden after Mr. Bacoat since he is the earliest of the caretakers that anyone remembers. 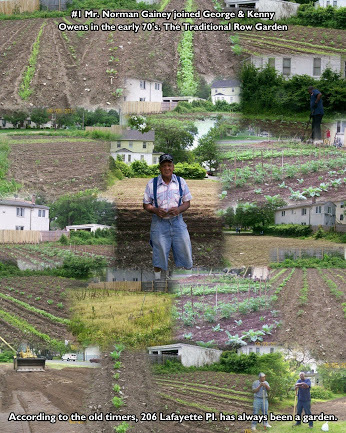 It is evident that the Garden would have had a totally different future if Mr. Bacoat had not chosen to farm the land at 206 Lafayette Place in addition to the land where the current Third Street Community Garden exists. 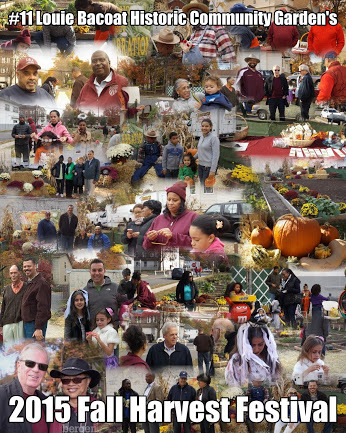 Dozens of residents born and raised in Englewood in Mr. Baciat's time have been interviewed about the garden. Everyone remembers Mr. Bacoat and his horse drawn wagon, the collard greens, knife and lawn mower sharpening and the lands that he maintained in the 4th Ward. Coach Evans remembers riding on the back of the wagon, as a child and helping out in return for collard greens delivered to his Mother as payment. 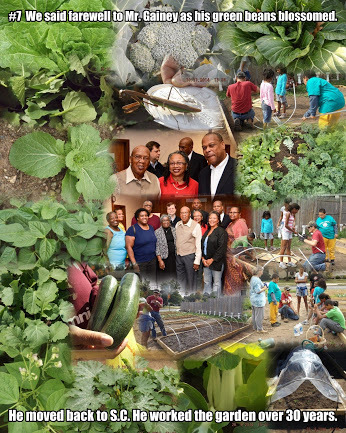 It is now a Community Garden on City Land that is overseen by the DPW and ran by the Life Long Learners of the Louie Bacoat Historic Community Garden Membership. Our Historic Preservation Committe includes people from different faiths and political affiliations. We are a learning institution and embrace all who share our love of the land. We are also asking that the site be designated a Historic site and preserved as such in perpetuity by the Englewood City Council. 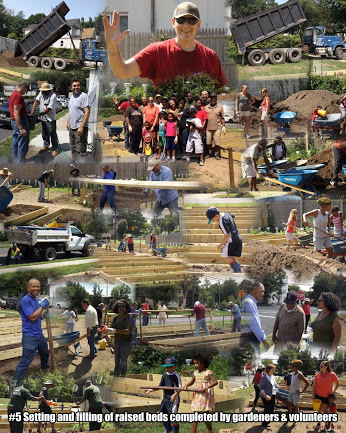 On December 15, 2015, the City Council (Resolution (#254-12-15-15) resolved to place the Louie Bacoat Historic Community Garden on the Recreation and Open Space Inventory (ROSI) for a period of 5 years. 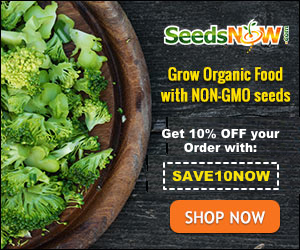 This is a database maintained by the Green Acres Program of the State of New Jersey. This database includes municipal, county and nonprofit parkland encumbered by the NJ Green AcresProgram. It is our goal to have the site officially recognized as a place of Historical significance as many buildings have been in the past. The African American Advisory Committee will recognize the site as Hallowed Ground on February 18, 2016 as part of the Black History Month Celebration. Join us in accepting this honor. The Garden is definitely a site filled with African American Memories. We agree with the concepts made immortal by the Indigenous people of the Americas, “all ground is Hallowed” and should be treated as such by humans. The Earth and the Sea are the Source of all life and must be revered and nurtured as such. There is only one PLANET. We must all nurture and care for it, because there is no Planet B. 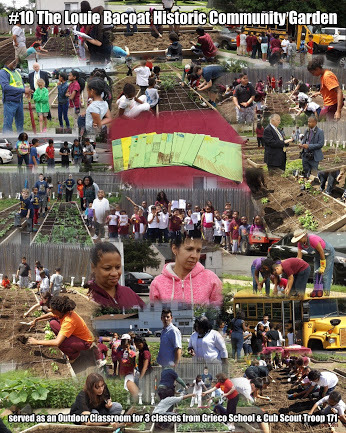 Members of the Community have come together in support of the garden. 3,514 people from all over New Jersey have given their support by signing a Change.org petition. 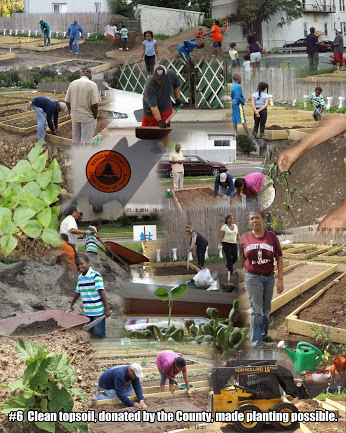 This petition asks that the City of Englewood designate the Louie Bacoat Historic Community Garden an historic site. We all fear that if this is not done the bulldozers will return and the garden will become an "impound parking lot" as was the plan. Last year, this time we had collard greens that looked like the one in this photo. We donated to the Annual Thanksgiving Dinner at 111 West Street. We will not be able to do the same this year because our cold crop growing season was seriously shortened by, shall we say, climate change. Regardless of how one feels about the issue, down here on the ground where things are growing or not growing, we witness the difference. As a result of the seriously hot and dry weather as compared to the cold crop season of 2014, our growing season was shortened. 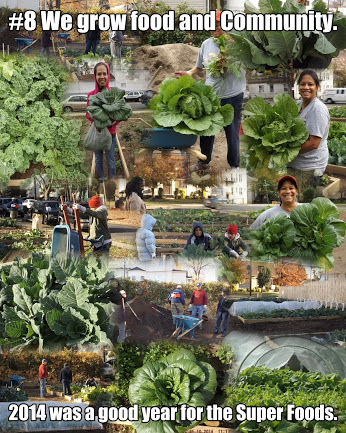 There will not be any giant collard greens to donate this year. The large greens in the Louie Bacoat Historic Community Garden were planted early summer and somehow survived the hot summer months. The few families that have these greens will no doubt use them in their own Holiday meals. It was a long, very hot and very dry summer. Weather researchers say that it was one of the hottest and driest summers in 90 years. We purchased 2 flats of collard greens. My friend planted hers right away. I did not. It was clear that the plants were being attacked by cabbage worms and it was too hot to plant them out in the open garden. I kept them in partial shade and hand picked the worms off. I used a safe homemade insecticide. I pampered them until the prolonged hot spell was forecast as coming to an inevitable end. The greens in the photos below can be eaten, but it would mean picking before their time. They are barely infants with the small number of leaves. What my farming Dad referred to as an "Indian Summer" or unusually warm weather into December could change that, but dare we wish for it? brings in the big machinery. for the blades to go deep. We want Howard to have a second term on the School Board. change in the School Board. has changed to include education. We like the change in landscape. of opportunity for our children.